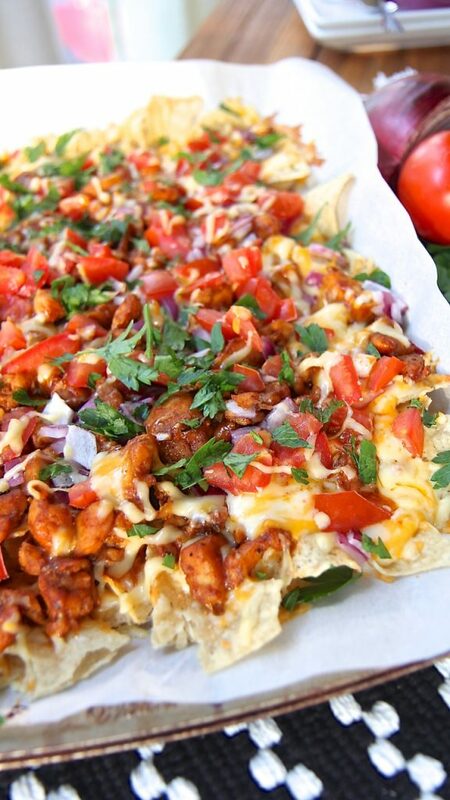 Watch me make these BBQ chicken nachos from start to finish! NACHOS! NACHOS! NACHOS!!! 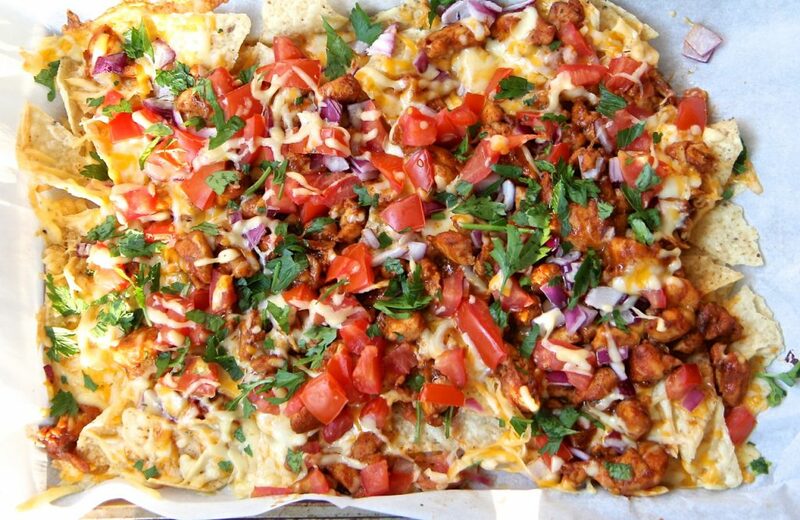 I don’t even want to talk about how many times I’ve made these BBQ chicken nachos this week! It’s pretty sad actually, especially since I’m currently doing a 3-day cucumber detox (don’t ask) with a friend. I’m just gonna have to start that detox again next week. Matter of fact, I don’t even know why people ask me to do detoxes with them (or why I agree) knowing full well how I feel about food and how I have no shame in dragging other “dieters & detoxers” into food indulgences with me. I’ve stated plenty of times that I’m not a very good diet-workout friend so there, no denial over here sister! 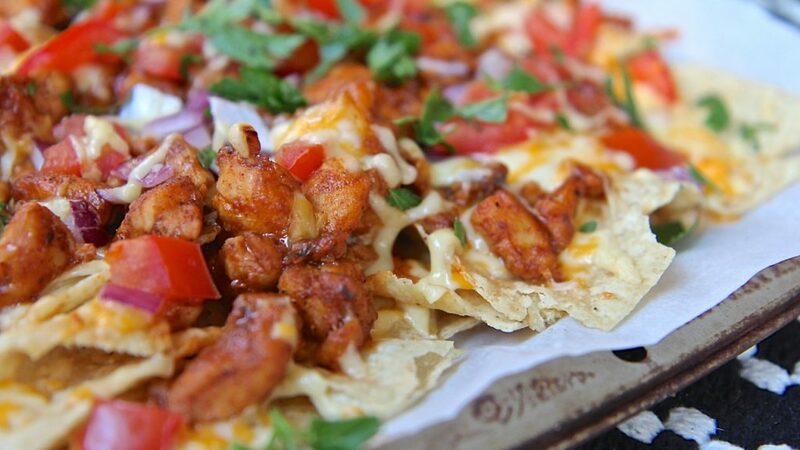 Ok now that that’s off my chest lets talk about BBQ chicken nachos!!!! Yessss that cheesy, crunchy, fresh, bbq-ey goodness!! Every bite is like a flavor explosion! I think I’ve found my new favorite go-to snack-appetizer-dinner. It’s just so versatile and EASY!! 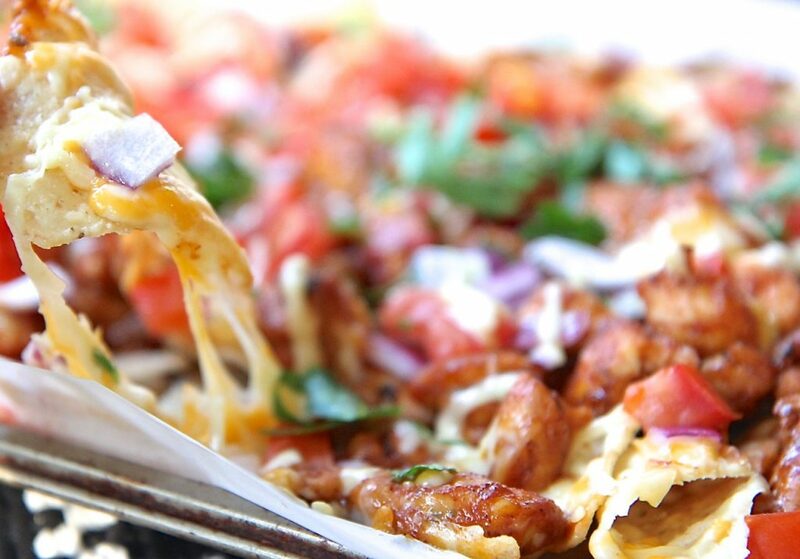 You really can top whatever you want onto these BBQ chicken nachos. I’ve found that I live for simply adding fresh tomatoes and red onions! Amazeballs!! You can also be versatile with the cheeses as well and I highly recommend mixing up several different varieties. My go-to is gouda and Colby jack! I also like to mix up several different BBQ sauces as well like a smokey BBQ sauce mixed with a sweeter one. Of course you can make your own homemade BBQ sauce as well. When I make these for the whole family I put them into little round cake pans lined with parchment paper. That way each person gets to customize it just the way they like it. It makes for great movie food by the way. We pile up in our family theater and go through several batches of nachos! 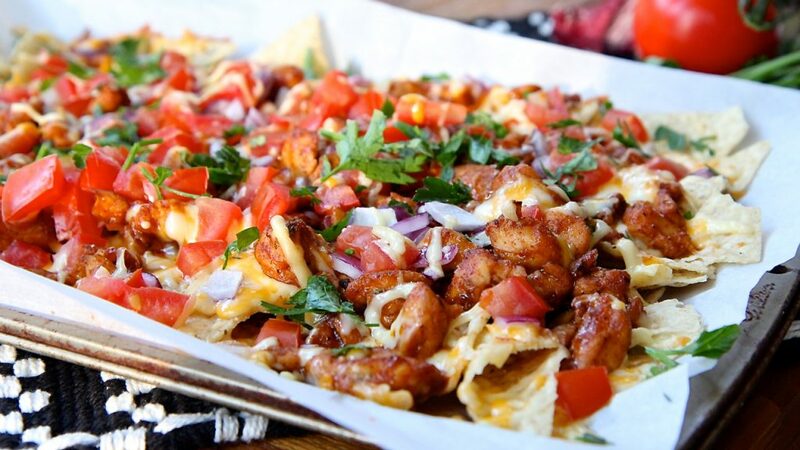 These BBQ chicken nachos or any homemade nachos for that matter needs to be served ” piranha style”! Meaning you or your guests need to be ready to swoop in and devour it as soon as it comes out of the oven for the BEST, epic, signature stretchy, cheesy experience. I guess this is why nachos are such a great half-time game day appetizer! Line a 13 x 9 inch baking sheet with parchment paper and set aside. Mix together spices and sprinkle them over the chicken, tossing to coat. Set aside. Add chicken and cook until almost done. Stir in BBQ sauce and continue cooking until sauce is mostly absorbed and chicken is done. Set aside. Spread tortilla chips in a single layer on prepared baking sheet. Add on BBQ chicken and then sprinkle with remaining cheese. Add on onions and tomatoes. Don't buy the pre-shredded cheese. They won't give you that gooey, stretchy cheese the way hand-grated cheese will. Wonderful..the best nachos I’ve ever had.